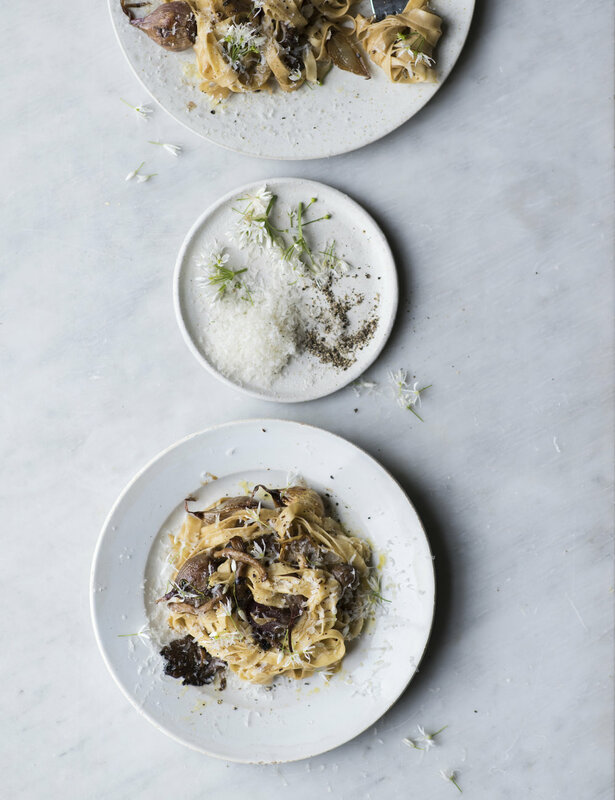 I’M AS MUCH A LOVER OF PASTA AS I AM OF COFFEE AND THIS DISH SUBTLY COMBINES BOTH OF THOSE. FRESHLY MADE TAGLIATELLE WITH COFFEE POACHED AND ROASTED SHALLOTS, MADE USING LAVAZZA’S QUALITY ROSSA ROAST AND GROUND FOR AN RICH AND EARLY NOTE. THE MUSHROOMS ARE ALSO FRIED WITH THE PRONTISSIMO INSTANT COFFEE WHICH ADDS A RICH UMAMI NOTE TO THIS DISH. VEGETARIAN PASTA LOVERS SHOULD GIVE THIS ONE A TRY. ONCE RESTED DIVIDE YOUR DOUGH INTO FOUR THEN USING A ROLLING PIN | ROLL IT OUT INTO A RECTANGULAR SHAPE READY TO PASS THROUGH YOUR PASTA MACHINE | BE SURE TO PASS IT THROUGH EACH SETTING TWICE BEFORE FINALLY PASSING IT THROUGH THE TAGLIATELLE SETTING | YOU CAN ALSO ROLL THIS OUT WITH A ROLLING PIN, JUST ENSURE YOU ROLL OUT THE PASTA UNTIL IT’S ALMOST TRANSPARENT | NEXT GENTLY FLOUR AND FOLD INTO FOUR BEFORE SLICING IT INTO THIN STRIPS OF TAGLIATELLE | ONCE CUT EITHER GENTLY ROLL ROUND YOUR HAND INTO SMALL NESTS USING FINE SEMOLINA TO PREVENT IT FROM STICKING OR LAY OUT FLAT WITH A SPRINKLE OF SEMOLINA | PLACE IN SALTED BOILING WATER FOR 2-3 MINUTES OR UNTIL AL DENTE WHEN READY TO COOK.